Everything we were told about Canada’s North Channel is true… it’s magnificent! More like Colorado than ever, it has even bigger boulders and more pine trees on small foothills. But it is all surrounded by gorgeous emerald green water so clear you can easily see 15-20 feet down. Before entering the North Channel, we stayed at Killarney Mountain Lodge Marina for two days. I fell in love with its mountain decor, pristinely beautiful and expansive grounds, and refreshing pool. If you’d like a Canadian vacation not too far from the States but far away from it all, I’d highly recommend this place. Free kayaks and canoes, too! Only bad thing about the North Channel is the poor internet connection. But then again, maybe that’s the point! We headed toward home in FOG. 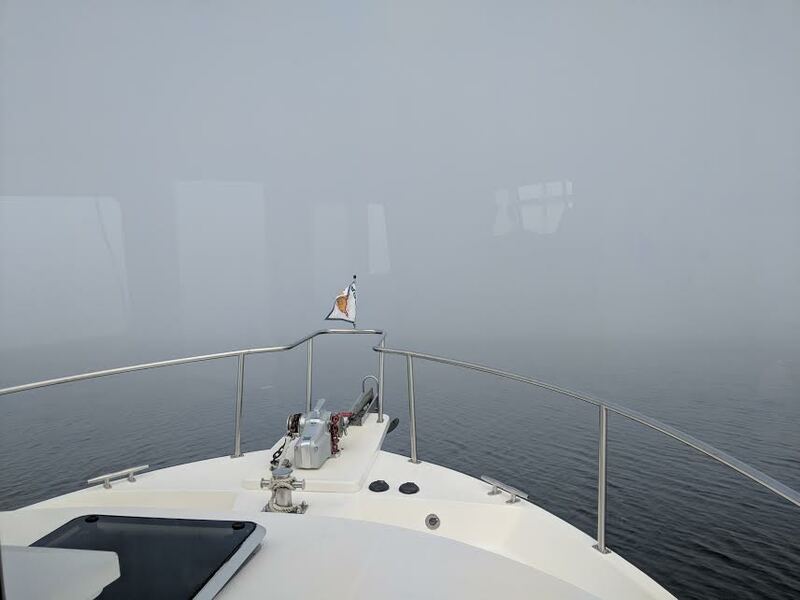 It’s utterly nerve wracking floating through water blindly when visibility is only a half mile – good for the prayer life! But it doesn’t faze Captain Craig who is used to flying airplanes in clouds by instruments only. Ugh. Yesterday we re-entered the good ol’ USA at Drummond Island, Michigan! We were in Canada for exactly one month and it was very lovely but it’s great to see the stars and stripes flying again, besides on the back of our boat. Today we are headed to the Les Cheneaux Islands in Northern Michigan to anchor out a few days before our stay at Mackinaw Island on July 18th. Beautiful country. It looks like you are all alone out there. So very peaceful with Mother Nature. That’s true, it’s very remote and not many folks were out there. It’s a getaway spot for sure! Now that is some natural waters I’d be happy to swim in! How were the temps? That Mountain Lodge location looks like it was all yours mostly. How delightful! Keep the posts coming. Love them!! The water temps were in the mid 70’s. Perfect for a refreshing swim to cool down in the afternoons. Swimsuits optional based on the proximity of other boats!